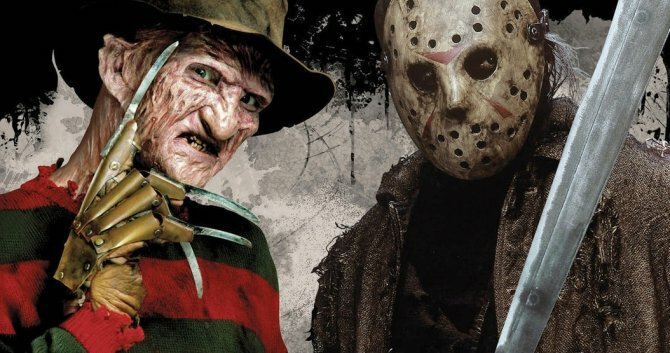 Long before any sort of justice had ever dawned, Freddy vs. Jason debuted in cinemas as what may be remembered as the first notable crossover between two major film franchises. Since then, we’ve received a couple Alien vs. Predator movies, the second of which performed so poorly that Fox split them back into their own separate entities, and to a much, much lesser extent, Lake Placid vs. Anaconda. Believe it or not, though, the road to getting the dream mashup between the two slashers made was treacherous indeed. With the first seeds having been planted in the closing moments of 1993’s Jason Goes to Hell: The Final Friday, you’d have thought we were off to the races. Alas, we we wrong. None of us could have foreseen that the Hell Jason had actually been sent off to was that of the developmental variety, but, technically, he did at least get to go to space in Jason X before visiting Elm Street, so that’s something, right? Anyways, after burning through script after script after script, New Line Cinema was eventually ready to get it done, with the momentous motion picture arriving in theatres in 2003 to a middling reception. Among other things, fans took issue with the ending, as it sees the titular fight finally going down, though there wasn’t exactly a clear winner crowned. If you recall, Jason appeared to walk away victorious, holding Freddy’s severed head in his hand, only for us to see the Springwood Killer wink at the audience and let out a laugh as the credits rolled. It was a decisive way to conclude things, to be sure, and now, in a recent interview with EW, director Ronny Yu’s explained the logic behind the scene. Like it or loathe it, that’s Yu’s explanation, and in many ways, it does make sense. Choosing just one winner would no doubt upset the losing character’s fans. On the other hand, though, doing things the way he did does kind of feel like a cop-out. In other words, you’re damned if you do and damned if you don’t, and given his situation, Yu did the best he could – in our opinion, at least. What do you think, though? Were you happy with the way things ended in Freddy vs. Jason? Take to the comments section and let us know!